The words Amish schoolhouse give most of us an image of a small white frame building in a secluded rural spot, with children in Amish clothing playing ball or tag outside. That’s the most common image we have, especially of the Pennsylvania Amish—a very real image that I have often seen here in central Pennsylvania. But Amish haven’t always had their own schools. Up until the late 40s, most rural children—both Amish and English—attended small local schools within walking distance of their homes. These were often one-or-two-room schoolhouses, sometimes with a single teacher. Farm children went to school in these setting through eighth grade, when it was common for only a few youngsters to go on to a high school. Many, if not most, quit school at this point to help support their families. In the aftermath of World War II, the culture of the country changed. The key word for American culture became progress, and that concept included schools. Small, one-and-two-room rural schools were closed, large consolidated high schools built to serve families from a number of communities, and the idea of a small local school gradually disappeared. In many areas with large Amish populations, the plans of state educational bodies and the needs of Amish families came into direct conflict. As long as their children could attend small local schools with neighboring farm children and quit school after eighth grade, the Amish were content to send their youngsters to public schools. But when it came to busing children long distances to spend the day studying subjects which their parents considered unnecessary or in opposition to their beliefs, Amish parents balked. 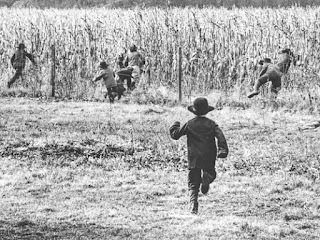 Did you know that in one fall term in the early 50s, over a hundred Amish parents in the Lancaster County area were jailed for the offense of refusing to send their children to consolidated schools? This was only one example of a peaceful struggle that went on for years as the Amish sacrificed themselves for the right to educate their children according to their beliefs. Sometimes the school boards and the Amish parents were able to come to a peaceful agreement, working out a compromise that allowed Amish youth to satisfy school requirements through supervised work experiences in Amish farms and businesses. In other areas, the struggle went on, with many school boards and state education departments determined to force the Amish to accept their standards while the Amish were as determined to hold onto their belief in living separate. One particular incident and a simple photograph began to change the viewpoints of many Americas. This image of Amish children running into a cornfield to escape the bus which had arrived to forcibly take them to a regional school moved those who saw it so much that people began to question their assumptions. The photo was reprinted in a number of publications, and a groundswell of support began to build. 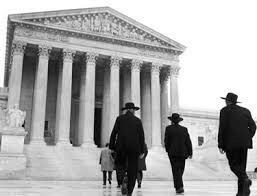 Finally, in 1972, the case of Wisconsin v. Yoder, with the support of many outside groups that supported religious freedom, the Supreme Court of the United States affirmed that Amish children could not be placed in compulsory education past the 8th grade. The ruling stated that the parents’ fundamental right to freedom of religion outweighed the state’s interest in educating its children. One justice commented upon the fact that the Amish system obviously worked, since no Amish person had ever become a burden to the state. 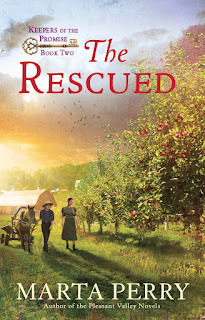 My current book, THE RESCUED, Book Two of the Keepers of the Promise series, tells the story of one Amish mother willing to face imprisonment rather than abandon her beliefs. 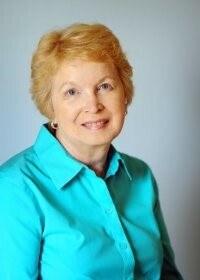 Marta Perry is the author of over fifty inspirational novels, with more than six million copies of her books in print. 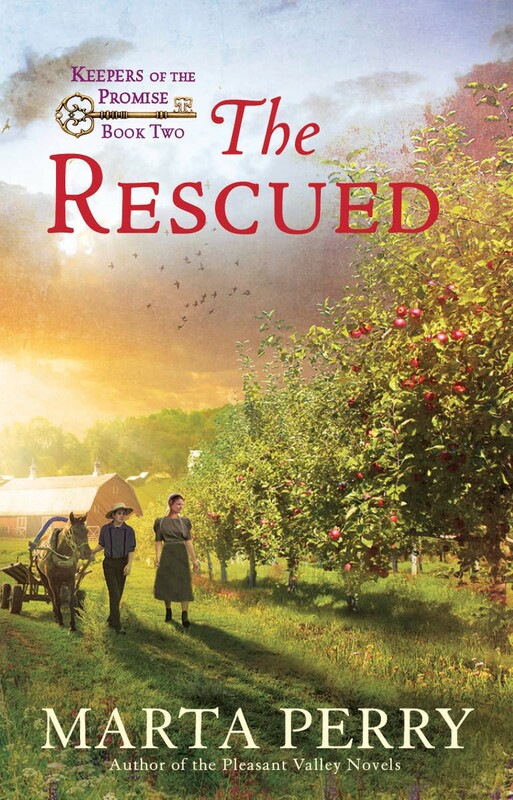 A lifelong resident of rural Pennsylvania, she writes from her own Pennsylvania Dutch heritage and her deep familiarity with the Plain People in her current Amish novels. What a fabulous reminder of the faith upon which our country was formed and the people willing to stand firm (and rule well) regarding that foundation. Thank you for sharing this fascinating post, Marta! I look forward to reading the Keepers of the Promise series. I loved this post, Marta. Thank you so much for the wonderful read! I loved reading this post, Marta! Thank you so much for sharing it. So glad you enjoyed reading about this fascinating period of Amish history. The Amish really gave a wonderful example of nonviolent resistance in this situation, remaining true to their beliefs no matter what it brought them.